Inflammatory bowel disease (IBD) is often thought of as something that only affects the digestive tract, but there is more to the story. The first thing to remember is that the mouth is part of the digestive tract, and therefore could also be affected by IBD. Some people with Crohn's disease or ulcerative colitis may have ulcers in the mouth, called aphthous stomatitis. While it is not common, there are cases where people with Crohn's disease have experienced Crohn's inflammation in the mouth. One part of the mouth that gets overlooked sometimes, however, is the teeth. Teeth may not be directly affected by IBD as the soft tissues on the inside of the mouth are, but instead are indirectly affected, such as by medications and nutritional factors. One study showed that people with Crohn's disease needed more interventions at the dentist than healthy people of a similar age. The same was true, to a lesser extent, of people with ulcerative colitis. What this means for people with IBD is that there needs to be a focus on keeping teeth healthy, as well as dealing with the other problems IBD brings. People with IBD have been shown to experience periodontitis, an infection of the gums around the teeth, more frequently than people without IBD. Periodontitis carries a risk of tooth loss, and, therefore, leads to more trips to the dentist for care. Smoking is one issue that compounds the risk of periodontitis in people with IBD. People with Crohn's disease who smoke have been shown to have a worse disease course. Smoking is also a risk factor for periodontitis, and people with Crohn's disease and ulcerative colitis who smoke increase their risk of developing the condition. It's strongly recommended that people with IBD not smoke in order to avoid complications (even those with ulcerative colitis). People with IBD have also been shown to have more cavities than people who don't have IBD. One study showed that people with Crohn's disease have an increased level of two different types of bacteria in their saliva, Lactobacilli and Streptococcus mutan. The study also showed that people with Crohn's disease drank more drinks containing sugar than healthy controls did. This result is not meant to shame people with Crohn's about their diet, as there are good reasons why people with Crohn's disease might consume more drinks with sugar. People with IBD may have a need for liquid nutritional drinks because of a lack of nutrients in the diet or sports drinks to combat dehydration. Instead, this is another point to keep in mind about oral health and that it is important to get regular preventive care. It's unclear exactly if or how IBD medications may affect oral health. Many people with IBD are treated with steroids, such as prednisone, during their disease course. Prednisone may be associated with an increased risk for dental cavities, but there is no research on people with IBD, although there are anecdotal reports. Skipping the dentist is not uncommon in adults, especially when there are so many other factors at work. People with IBD already see various physicians on a regular basis and may have a significant financial burden to go along with it. Getting teeth cleaned twice a year or taking care of other oral problems tends to get pushed down the list of priorities, which is understandable. However, like many aspects of healthcare, appropriate preventive care is going to be the most important factor in avoiding future problems. 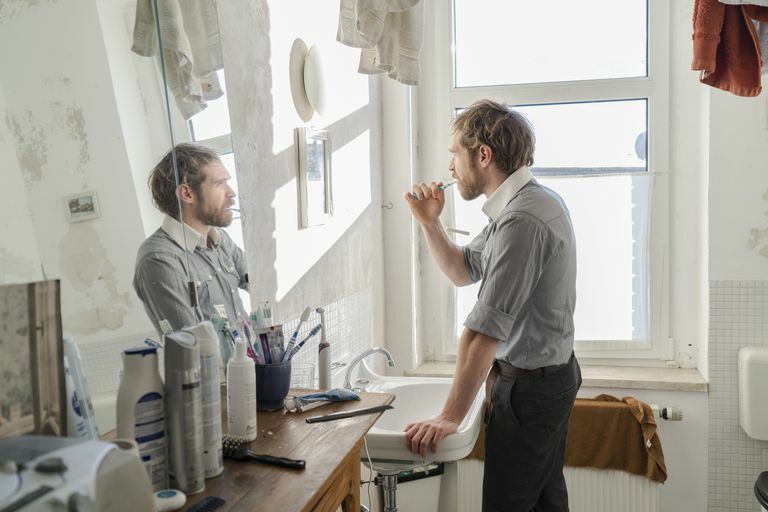 Brushing and flossing twice a day is recommended oral care for most adults, but people with IBD should ask their dentists if other daily care is necessary. Finding a dentist that has experience with patients who have IBD can take time. It may be worth asking a gastroenterologist for a recommendation to a local dental practice that has experience with patients with IBD or other chronic illnesses. Some dental procedures may call for the use of antibiotics or non-steroidal anti-inflammatory drugs (NSAIDs) and a gastroenterologist should be kept in the loop when these drugs are used. This is because antibiotics and NSAIDs have both been shown to cause problems for some people with IBD, such as diarrhea or even a flare-up. It's increasingly being understood that IBD affects the whole person. This also includes the mouth and the teeth, although it might not be the part of the body that most people with IBD are focused on. It's worth talking with a gastroenterologist about finding a dentist that can help not only if there are problems, but also with preventive care. It's possible that people with IBD might need to schedule more cleanings or have a specialized oral care routine, especially before or after surgery. Telling a dentist about the IBD and also about any medications is also important, especially when dental procedures are needed. Brito F, de Barros FC, Zaltman C, et al. "Prevalence of periodontitis and DMFT index in patients with Crohn's disease and ulcerative colitis." J Clin Periodontol. 2008 Jun;35:555-560. Grössner-Schreiber B, Fetter T, Hedderich J, et al. "Prevalence of dental caries and periodontal disease in patients with inflammatory bowel disease: a case-control study." J Clin Periodontol. 2006 Jul;33:478-84. Johannsen A, Fored MC, Håkansson J. "Consumption of Dental Treatment in Patients with Inflammatory Bowel Disease, a Register Study." PLoS One. 2015; 10: e0134001.